Special offer from the Vancouver Hotel Destination Association and American Express, available for booking until 16 November 2014. Vancouver Hotel Destination Association is a group of 36 central Vancouver hotels, whose purpose is to enhance Vancouver’s destination awareness. How does this deal work: for stays until 28 February 2015, you receive at check-in American Express Gift cards with a value between $75 and $125. Amounts expressed in Canadian Dollars. Cards are offered per stay basis, so the biggest deal is when you stay only one night, because the card will offset most of the hotel cost. 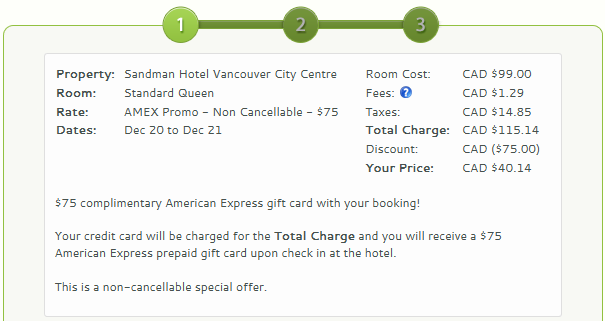 You will pay online the cost of the room in full and at check-in you will receive the gift card. These gifts cards can be spent anywhere you like (you are NOT restricted to hotel services). These are pre-paid, non-refundable rates. Furthermore, 1 in every 10 bookings on the association's website are free. So if you are lucky 10th you will get the stay for free. These hotel.info voucher code are valid for travel until 31 December 2014. There are currently three promo codes, depending on the total value of your reservation. The codes work only for flexible reservations, which can be cancelled (the discount code box does not activate for prepaid, non-refundable rates). These promo codes work also for large international hotel chains. Rooms starting from as little as €29 at selected Holiday Inn, Crowne Plaza, InterContinental hotels in Europe. The promotion is available for booking until 1 November 2014 for travel between 16 December 2014 and 14 February 2015. There are options to book this special rate with or without breakfast (except Holiday Inn Express, where breakfast is always included). Without breakfast is the standard option which will be shown when you go to the promo page. With rooms available in many European capitals and popular tourist destinations, there should be something for everyone for the upcoming winter holidays. Good deal for return flights with Turkish Airlines from New York, Boston or Washington directly to Istanbul, Turkey. These low prices for direct flights are available until the end of March 2015 (perfect for the Spring Break of St. Valentine's Day). We recommend using SkyScanner to find the websites offering the lowest prices for these flights. Let us know if you took advantage of this great offer. This deal is offered by TravelPony, with free cancellation up to 72 hours before check-in date. This promotion gives a 40% discount compared to the Hyatt official website or the large online travel agencies. The code should be typed on the right-hand side of the payment page, in the "Summary" section, in the field "Apply Promo Code". These discounted rates at the 4-star Solar Do Castelo include breakfast and are sold by OnHotels, an UK-based online travel agency. The promotional rates is available also for week-ends. In the payment window, make sure to use this 5% OnHotels discount code. Using the links above you will save about 40% compared to the large online travel agencies like Booking.com. These discounted rates at the 5-star Hilton Budapest Royal Castle District include breakfast and are sold by OnHotels, an UK-based online travel agency. The promotional rate is available also for week-ends. Thus, the rate arrives at less than €80 per double room per night, breakfast included, which is 40% less than the price offered by the Hilton official website or the large online travel agencies, like Booking.com, for example. Air France offers a 111€ discount for all long-haul flights where the price is of minimum 140€ (before taxes, fuel surcharges and fees). Flights within Europe or to North Africa and the Middle East are not eligible for the promotion. The Air France promo code is valid for travel from until 31 March 2015. In that window, look for the field "Do you have an Advantage code" and there type in the promo code. Then continue with the reservation as usual and in the next window you will see the price dropped by 111€. We have written before about the Best Rate Guarantee programme of InterContinental Hotels Group (IHG) the world largest accommodation provider with hotels such as InterContinental, Holiday Inn, Crown Plaza, Hotel Indigo, etc. In summary, when you make a reservation through the IHG official website and find the same room in the same hotel cheaper on another website, you may receive the first night of your stay for free (also for one-night stays). See full details on the procedure here. Let us know if you ever tried such a claim and if it worked for you. TravelPony is now a well-established hotel discounter with a worldwide presence. If you already have an account, why not ask a member of your family to create his / her own account, to benefit from another 35$ credit. Please pay attention: we test-tried the site a couple of times and it does not always provide the best deals that can be found online. Thus, before making any booking, please check you regular websites and also our top 10 discounters. lastminute.com offers a £50 voucher for flights + hotel packages to New York. A minimum 4 night stay is required to benefit from the discount. The promotion is available for booking until 19 October 2014, for travel also in 2015. The Priceline discount code is valid for stays of minimum 3 nights at 4-star hotels until 31 December 2014. These discounts are available for booking until 19 October, for travel until 31 July 2015. There is no minimum purchase for hotels, however a minimum purchase of 450 CHF applies for flight+hotel packages. The discount coes should be applied on the top of the payment page, just above the credit card information, in the "Promotion code" section. This offer is brought by Design Hotels, a collection of more than 250 boutique hotels in more than 45 countries. Nest Hotel is a newly opened 5-star hotel located in Incheon, South Korea's third largest city. This promotion is offered for members of their community (similar to a loyalty programme, you just have to join for free here, to become a member). Once you've performed the search on the link above, look for the rate called "Design Hotels Welcome Community Rate" (it is the first rate shown). You will see that for each night until 31 December 2014, prices are half of those shown by large online agencies, such as booking.com. H10 Hotels is a Spanish based chain of quality hotels located mainly at sea-side locations, and also in some European cities. For bookings until 19 October 2014, they offer 25% discount on all city hotels located in Barcelona, Madrid, London, Berlin and Rome. The code works as well for holidays during the upcoming Christmas, New Year's Eve and Valentine's Day. This Thomas Cook promo code is valid for all holiday packages with departure in November and December 2014 (£800 minimum spend). The Thomas Cook coupon code must be typed in the payment window, in the field "I have a promotional code", just above the credit card information. This Hotelopia promo code is available for bookings made until 26 October 2014, for "pay on-line" rates (not valid for "pay at hotel" rates). The coupon code must by typed in the payment page, in the field "Discount code", just below the client contact information. These discounted rates at Novotel Amsterdam City include breakfast and are sold by OnHotels, an UK-based online travel agency. The promotional rate is available also for week-ends. These low prices of €80 are available when booking two nights or more. Palazzo Viceconte Hotel**** is one of the best options when visiting the world-famous Matera and its UNESCO World Heritage sites. We searched for the best prices at this property and saw that the best prices are usually obtained with CheapTickets (an online travel agency part of the Orbitz group). This is because of their discount codes that will give you the cheapest rates at Palazzo Viceconte Hotel. 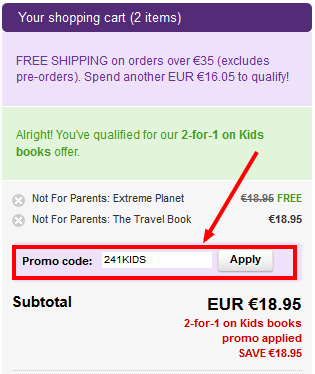 The voucher code must be typed in the form "Promo code", in the payment window, above the credit card information. The highest RatesToGo promo code we've seen. This equals to a 25% discount over the four nights at this hotel part of the Red Carnation collection of high-end hotels. The hotel is located opposite the Buckingham Palace, a great location for exploring London. Type the code in the field "Promo Code", just above the "Check availability" button in the search form. This discounted rate is called "One More Night" and is the cheapest one you can find at The Rubens at the Palace Hotel. Aegean Airlines (a Star Alliance member) offers return flights from several European locations to Amman at under 300 €per person. These prices are valid for travel at the beginning of the year 2015 (we checked to see that well into the month of March prices are still discounted). We managed to get the best prices with the online booking site GoVolo (prices directly from Aegean website were more expensive). We found deals for departures from London, Paris, Frankfurt. Probably there are many other airports from which you can get a similar deal. Let us know if you managed to book this deal. Hotels.com runs a Thailand sale promotion called "Thailand Has It All", which offers discounted rates at selected properties for stays until 23 December 2014. One property that stands out is the Courtyard by Marriott Bangkok, which is sold with a 30% discount. We checked several dates and this was the discount compared to the Marriott website. You might also try a Best Rate Guarantee claim, however the cancellation policy is not the same (one day shorter compared to their official website). You might give it a try though. We managed to find a 10% voucher code for car hire with Holiday Autos until 31 December 2014. Holiday Autos is one of our preferred car rental agencies, because of its large supplier base and low prices. This offer was originally addressed to those who pay with a MasterCard, so it is preferable to use this payment method when making the reservation (even though the reservation system allows using Visa or other payment methods). There is another online travel agency called EasyToBook that offers most of the booking.com hotel inventory, at the same prices as booking.com. However, EasyToBook also offers a 10% coupon code, that will actually mean that you save 10% from the booking.com prices. Finalise the reservation on EasyToBook. That's it, you just saved 10% off the booking.com rates. Expedia UK is making life easier with their new feature: a section of their website where they highlight good quality hotels at less than £49 per room per night. I find this useful when searching for travel ideas for the upcoming week-ends. Ever wondered: hmmm, where should we go next week-end? And then you see a really good hotel deal in Rome for example, you book the hotel and the flight and you're set. In the page that opens, just browse through the hotels listed, just below the search form. Barcelo is a chain of quality hotels and resorts with a good presence in Europe and the Caribbean. They are currently running a flash sale for the members of their loyalty programme. For bookings until this Monday, 5 October, you are offered flat 50% discount at a selection of properties in cities such as: Rome, Prague, Cologne, Barcelona, Istanbul, etc. The rates are non-refundable, so book only if your plans are firm. This offer is brought by Design Hotels, which is a collection of more than 250 boutique hotels in more than 45 countries. Once you've performed the search on the link above, look for the rate called "Design Hotels Welcome Community Rate" (it is the first rate shown). There, the cheapest rooms are the 20 sqm Queen Rooms. This special rate includes breakfast and can be cancelled free of charge up to 48 hours before check-in date. You will see that for each night until 30 November 2014, prices are half of those shown by large online agencies, such as booking.com. Lonely Planet offers not only travel guides for adults, but also a variety of interesting kids books. Until 31 October 2014 you can buy two kids books for the price of one.